Quantity: Minimum 50 pieces per colour. 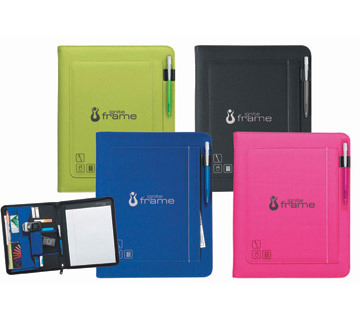 Cover Colour: Black, Fuchsia, Royal Blue and Apple Green. Zippered closer on main body. Interior organizer with file pocket. Mesh pocket with Velcro closer idea for cell phone or PDA.